Womens Day comes around so fast! On this special day, 8th March each year, Zambia celebrates women’s achievements and seeks to inspire young women to come forward and exercise their choice freely. The whole day is dedicated to empowering women. 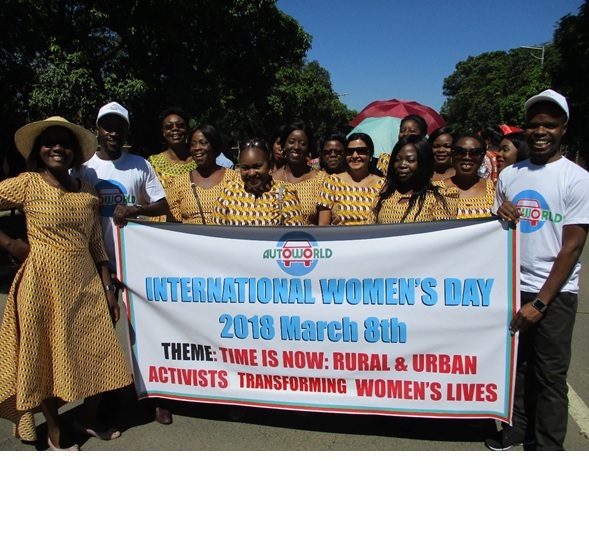 The theme for the 2018 Womens Day in Zambia was ‘Transforming Women’s Lives‘. In 1975 the United Nations declared 8th March as the official date for International Womens Day. Over 30 countries including Zambia have marked that date on their annual calendar as a public holiday. In support of gender parity goals, in 2015 the Zambian government passed the Gender Equity and Equality Bill which established the Gender Equity and Equality Commision. The purpose of that body is to promote gender equity, gender equality and integration of both sexes in society, and work towards the elimination of all forms of discrimination against women. Autoworld has not been left behind. We are proud to have on our team Annabel Zulu (HR Manager), Rupa Parikh (Internal Auditor), Phenny Kosamu (Auto Technician at Woodlands Branch), and Faides Phiri (Auto Electrics Supervisor at Downtown Branch), amongst many other valued female employees. Glenn Findlay, Autoworld Director, together with his daughter Maya, took some time to come and support the ladies that morning and we took some pictures with them (see below). The ladies thank the Autoworld management most profoundly once again this year, for helping them to participate in the International Women’s Day celebrations.